French scholar and journalist; born at Paris in 1826; died there March 6, 1902. After having brilliantly completed his education at the Collége Charlemagne, he entered the Ecole Normale in the section of philosophy, having for comrades Edmond About, Hippolyte Taine, Francisque Sarcey, and others, who afterward became distinguished in their respective walks of life. Cahen soon attracted the attention of his professors; and, while still a student, was entrusted with the teaching of philosophy in the College of Versailles. In 1849 Cahen graduated third at the Ecole Normale; and in the same year succeeded in obtaining the degree of "agrégé de philosophie." A year later he was appointed professor of philosophy at the Lycée Napoléon-Vendée, after having been nominated secretary to the French embassy at Madrid. A cabal among the clerical papers, however, soon caused him to lose his professorship. The incident gave rise to many press polemics, and brought about the resignation of the members of the Jewish consistory. The government then offered Cahen other positions, but he declined them all, and devoted himself to journalism. He collaborated on the "Journal des Débats," and for many years was attached to the editorial staff of "Le Temps." At the death of his father, Samuel Cahen, he assumed the directorship of the "Archives Israélites," which position he held until his death. Cahen lectured from 1859 till 1878 on history and literature in the Jewish Theological Seminary of Paris. 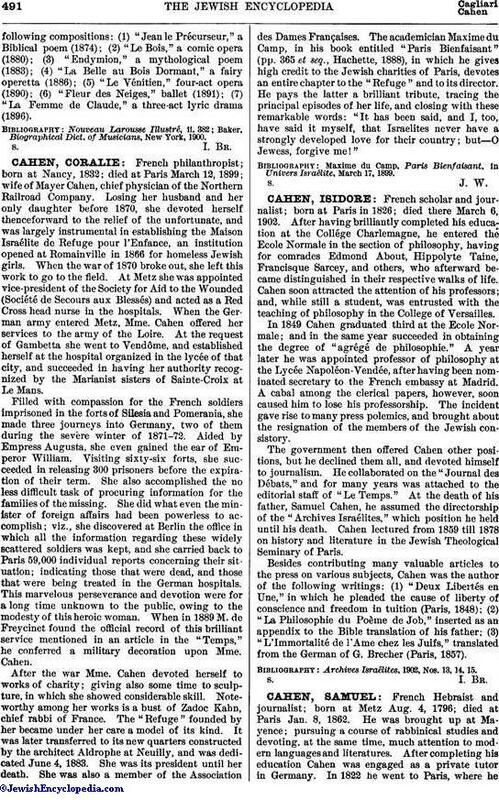 Besides contributing many valuable articles to the press on various subjects, Cahen was the author of the following writings: (1) "Deux Libertés en Une," in which he pleaded the cause of liberty of conscience and freedom in tuition (Paris, 1848); (2) "La Philosophie du Poème de Job," inserted as an appendix to the Bible translation of his father; (3) "L'Immortalité de l'Ame chez les Juifs," translated from the German of G. Brecher (Paris, 1857). Archives Israélites, 1902, Nos. 13, 14, 15.